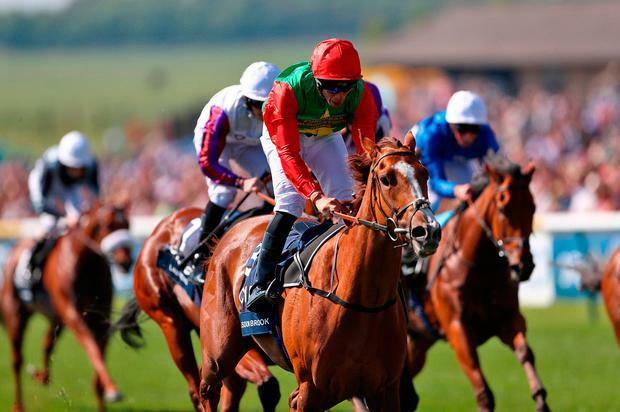 After six weeks of major races, jumps and Flat, being dominated by the same top yards and owners, racing found the antidote yesterday when 66/1 outsider Billesdon Brook landed the English 1,000 Guineas under Sean Levey at Newmarket. She may have been the longest -priced winner of the race ever but there appeared to be no fluke about the victory of Richard Hannon's filly as she galloped one-and-a-half lengths clear of the front-running Laurens for a convincing victory, with Aidan O'Brien's favourite Happily a half-length back in third. Like the Hannons' other recent Guineas winners, Night Of Thunder and Sky Lantern, Billesdon Brook was beaten in her trial. The five lengths she had to make up with Soliloquy from the Nell Gwyn looked a tall order. However, Levey, 30, who was born in Swaziland to an Irish father and Swazi mother, brought up in Rosegreen and started out as a jockey for O'Brien, for whom his mother is still housekeeper, went out for his first ride in the race in a positive frame of mind.